Some runners described the La Sportiva Uragano GTX as a comfortable running shoe. Several users mentioned that the shoe has a durable design. According to some comments, the grip is superb as it holds up on rugged terrains. Most buyers agreed the GTX element works efficiently; it keeps the foot dry on wet and snowy conditions. A few users commented that the Uragano GTX fits perfectly. The La Sportiva Uragano GTX is an expensive trail running shoe. 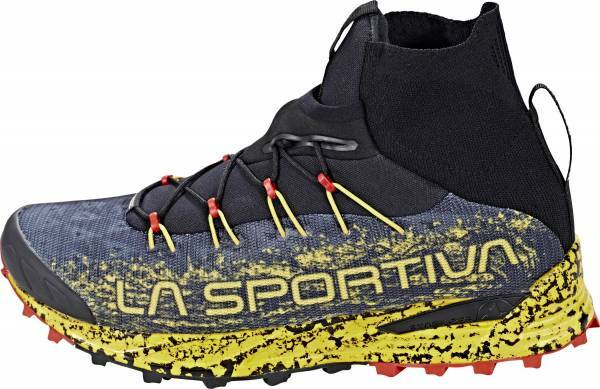 The La Sportiva Uragano GTX is considered by most trail runners as a great shoe that offers a good blend of durability, comfort, grip, and protection. Some users have minor issues but it does not affect the shoe's overall rating. Despite being expensive, runners still consider the Uragano GTX as a reliable waterproof trail running shoe. I was amazed at the boot like mid foot to rear of the shoe stability and foot hold. The underfoot platform and upper topped off with the gaiter had me thinking i was in an excellent hiker back there, while the agile, flexible forefoot had me feeling i was at the same time in a nimble if on the heavier side trail runner. This said, that versatility of experience came at somewhat of a cost of warm feet and thin and some times tiresome very front of the shoe toe fatigue and occasional rock bite. The La Sportiva Uragano GTX is a running shoe that’s made for those who want sturdy apparel to help them tackle the great outdoors. It features an aggressive design to highlight its purpose as a companion for the trails. Moreover, its façade has protective layers to act as shields against debris, rough surfaces, and water. The midsole has a full-length foam that’s meant to carry the foot throughout the running session. It’s also intended to protect against potentially harmful elements on the trails. The gripping lugs on the outer pad are patterned in such a way that a lot of them would always be in contact with the ground, no matter the structure of the topography. The La Sportiva Uragano GTX has a standard running shoe length. It adheres to the usual choices of consumers when it comes to size. The available width is D – Medium. It’s designed using men’s measurements, but it’s marketed as a unisex shoe. Female purchasers are encouraged to try on the shoe first to get a more pleasant in-shoe experience. The outsole unit of the La Sportiva Uragano GTX makes use of the FriXion® AT V-Groove™ which is a rubber compound that’s tough on the trails. It has V-shaped gripping lugs with shallow grooves to heighten grip on the surfaces. The Impact Brake System™ involves the strategic placement of the gripping lugs to make the most out of the traction capacity of the outsole. This design is also meant for uneven or jagged surfaces, as well as upward and downward paths. Injection Molded EVA is the main midsole component of the La Sportiva Uragano GTX. Its purpose is to mitigate the impact forces during the landing phase and encourage a springy liftoff. The Altra Lone Peak 4.0 also uses EVA as its main midsole component, which works under the direction of the proprietary technologies from the brand. A thermoplastic polyurethane unit is placed in the heel section to stabilize the foot and provide additional impact protection. It also bolsters the integrity of the foam midsole, making it more robust. Air Mesh is a soft and porous material that offers breathable support for the foot of the wearer. It has micro ventilation pores that allow air into the foot-chamber while also preventing debris infiltration. The Gore-Tex® lining staves off the water completely. It makes the runner more confident when running in extremely wet conditions. The 4-Way Stretch Scree Guard Gaiter is an integrated sleeve that extends to the lower part of the leg. It’s made of a durable material that acts as a barrier against abrasive foliage, rocks, and irregular surfaces. Responsible for adjusting the fit is the fast lacing system, which is comprised of round laces and fabric eyelets that work in conjunction with each other. There’s no need to do any of the customary tying; instead, tugging on these strands would tighten the coverage. Pull tabs on the back and front of the gaiter help the runner when it comes to wearing and removing the La Sportiva Uragano GTX.